Thursday August 20 1903 I baked bread and cake and was busy in the kitchen all forenoon. Mother and Alma Parvin were here a little while. I went out to the "old settlers" picnic at the fair ground in the afternoon and Will went as far as town. I called at Murphys on our way home. 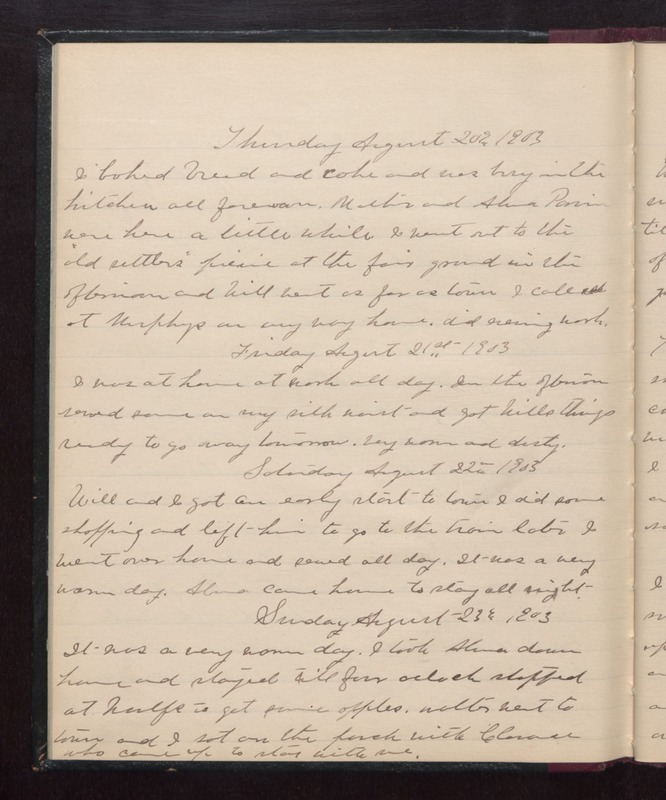 did evening wash. Friday August 21st 1903 I was at home at work all day. In the afternoon sewed some on my silk waist and got Wills things ready to go away tomorrow. Very warm and dusty. Saturday August 22 1903 Will and I got an early start to town I did some shopping and left him to go to the train. Later I went to over home and sewed all day. It was a very warm day. Alma came home to stay all night. Sunday August 23 1903 It was a very warm day. I took Alma down home and stayed till four oclock stopped at Woolfs to get some apples. Walter went to town and I sat on the porch with [Clarace?] who came up to stay with me.